In the evening of Sept 28th at Hội An Theater, the People’s Committee of Hội An city (Quảng Nam province) held a show to introduce their new cultural tourism product of Water puppetry. It is a brand new tourism product of the city which will be officially run from Oct 2nd. Mr. Vo Phung, Director of the Center for Culture and Sports of Hội An city said that “The water puppet show has been rehearsed for months at Hội An Theater and it has received support from the majority of locals and tourists”. After careful consideration, the People’s Committee of Hội An City decided to make this folk art form become a tourism product in purpose to meet the demand of international and domestic tourists who come to visit Hội An Ancient Town. 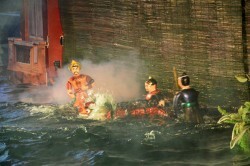 At the introduction show, in addition to the familiar plays of Vietnamese water puppetry such as fish catching, boat race, eight fairies dance, the artists of the Center for Culture and Sports of Hội An city performed different plays imbued with the culture of Quảng Nam such as Apsara dance, Legend of mamazu monster. Audiences gave them a non-stop applause after each performance.